AmerCom has extensive experience involving overhead sign structure designs. Over the past 5 years, AmerCom has completed the design of over 100 overhead sign structures for clients such as the New Jersey Department of Transportation, The New Jersey Turnpike Authority and private developers. AmerCom is also responsible for design of the recently released New Jersey Turnpike Authority standard overhead sign structure plans for the Vierendeel Overhead and Cantilever Sign Structures. These sign structures were custom designed to be architecturally compatible with the historic Garden State Parkway corridor. Their work in this regard involved development of detailed structural analysis, design computations and the plans for the various span arrangements as shown on New Jersey Turnpike’s standard drawings SI-28 thru SI-42 available on their website at http://www.state.nj.us/turnpike/standard-drawings.html. 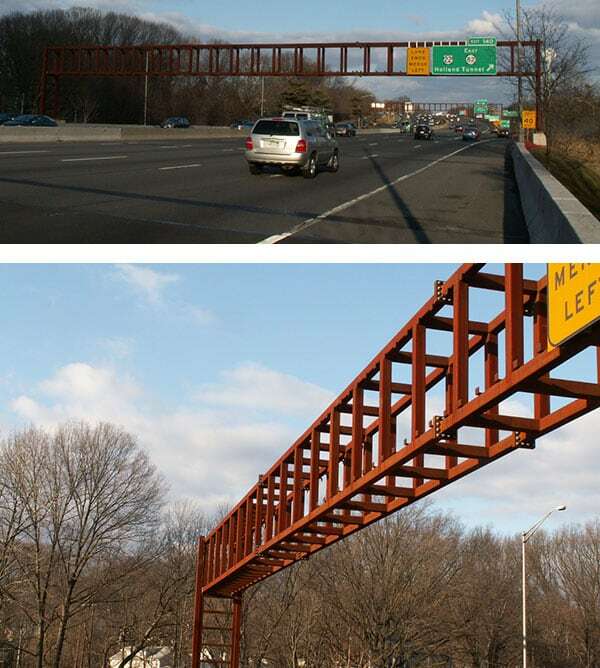 These plans which AmerCom developed are being used for all new sign structures installed on the Garden State Parkway.